not me, I have electrical heating in every room so I really don;t need it. we block up the windows with plastic, that keeps the draft out, I only have one drafty window though. Plastic wrap and double sided tape works wonder helping to keep the drafts down.. It is a good investment. I would say both......I would like to get one for back up...what is the oil burning one and how do you use it? Could you use it if the lights went out? I hope you are feeling better!! I had a wonderful weekend.....biggest show I have done so far. I think it's because I had stuff that others don't carry .....it's hand made and unique....I am not bragging but the lady next to me does pillows and she sold five all weekend.....I sold a ton of stuff.....too bad about the heater....I am looking for something in case the lights went out...and I don't have a generator and don't plan on buying one! Glad you like your candles! we have been thinking of getting one of those heatsurge things, they look like a fireplace and are made by amish. really neat looking and they say they only use about as much power as a coffee maker,. they are more expensive though so it might be a couple of months before we can get one but i eventually want one. Your probalby right. We would just be buying it because it looks good. LOL My mom has one like you just bought and loves it. she wanted one with the oil in it and it keeps her whole house warm. I think i will end up getting one of them for our hosue. I hate the thought of a huge gas bill . I would rather everything be electric. I'm not calling you a liar but My Goddness the same thing here is nothing short of 100.00 that blows me away. Good deal indeed. 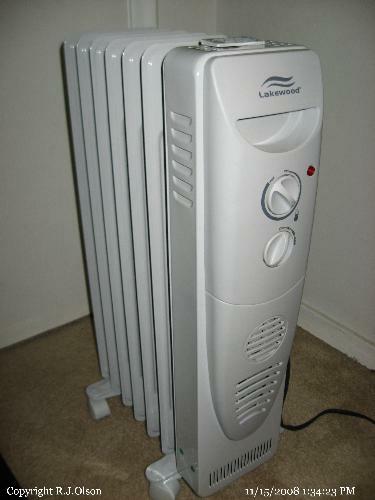 I have never owned one of these heaters but I have always wanted one. I've been told they work really well. I so wish I was there, I still can't believe how cheap. WOW!!! I just called Wal Mart in the hope they came down but I was told they no longer get the small ones in because they were not seeling at 129.00. She told me the biggar models are selling and Yes they have some in stock and they're 199.99 plus tax. I've always known our prices were higher but WOW. We have two in our house and are planning on getting more. With the price of oil today there is simply no way for me to heat my house. Last year in three months I spent over $900. That was after sealing the windows to escape the drafts. Too much for this one. It may be a bigger draw on the electric bill but I figure it's worth it as there are so many oother ways to conserve electricity. I really could care less about the asthetics. As long as it keeps us warm and safe that's all that matters. I have never seen a space heater like that but it does look very nice and I can't get over that price. I have only bought one space heater years and years ago. My mother had one but I don't guess I am familiar with the oil filled radiator type like you got. Unless something goes wrong with our electric heat/air I don't plan on having to buy any space heaters but if I did I would really be looking for the safety of it and the effeciency. Well I guess I am like your father. I have to have me a heater in my room too. I have central heat but by the time it kicks on I am cold. When my children were living here they would always say they were not cold but I would be and when they would come into my room they would say it is to hot in here. I like the heater you bought for your father. Mines come from Wally World too. Yes I bought a new heater last week. It is one of them new halogen ones that light up your room very brightly also. It cost around £15. It does give out some heat, but I was slightly disappointed with it as it took forever to do so. It does not look to safe either, but it has a cut of switch if it is knocked over also. My house is quite new, but my lounge is big and cold. I would not recommend this heater to anyone. I should of paid a few more pounds and got one like your Fathers. It should keep him nice and snug on the long, cold winter nights. We have an eletric space heater with no special features except a timer. I would prefer the automatic shut off safety feature. I also want one with a thermostat and more then one setting. That is a really nice space heater you bought at Wally World . Your dad will like it and now he can keep warm. We have two space heaters that we have but did not use them yet this year. Last year I used one in my bedroom cause I was always cold even with the heat on. We have one of these. We use it to warm the areas that the heat doesn't reach. The back rooms get rather chilly when we have a fire going in the fireplace. The furnace doesn't go on so there is no heat in those rooms. I don't give a fig about the looks, as long as it does its job and is efficient. We are going to purchase another before too long. I really like the oil filled radiators. I think they are safer to use then some of the other ones. Also I think they are more energy effiecient then others too. I think you made a good choice. I need to get one for my kitchen, the pup we had chewed the cord up. I can replace the cord but then I want to feel safe at night sleeping. I sleep upstairs and the heater would be unattended downstairs, that would concern me with a taped up cord. We have 2 of them. I love them, they work very well! I got one of these last year through FreeCycle. My apartment is a former walkup attic that was converted to an apartment. A lot of the insulation is either gone or so old it's ineffective (the snow melts on our roof before anyone else's), so even with radiators, it gets cold. My daughter told me (since she's there and I'm not at the moment) that it works so well, the entire apartment stays comfortable. Now, I haven't been there to know if the outside gets hot or not. But, I have told her to not leave it on when she leaves, just in case. Either way, though, I think the radiated heat is more efficient than the blowing space heaters with coils. Plus more cost effective. I'm glad I got it and always keep my eyes open for another one someone might want to part with. I used to of had one of those. It was wonderful. It wasn't very good at getting a room warm fast but once the room got warm it kept it warm. And it is safe and won't cause fires. As it stands now, I'll let my ac/heater do the work. I do have one cold room that I used to get a little space heater for, but since I'm not using that room anymore, I think the person who will be will be fine, she likes it cold. That is such a good choice for the bedroom as anything touching it will not catch fire. I am always afraid of space heaters and fire as it seems to happen too often. Those microfurnaces that were all the rage a few years ago were pretty good but I would prefer the oil filled radiator models like the ones you got. I am in Canada and saw some smaller models like you have for a similar price, but I cannot remember the store. Good choice, especially for an old person who might be careless with another type of space heater. I have a space heater too but it's really small but it puts out a good amount of heat! lol All I ask is to be very careful with them things and never have one on in a room that you're not in because years and years ago my parents had one in my brothers camper to keep the pipes from freezing inside and during the day they'd turn it off. Well the plug and cord overheated and was by the trash can and it set the can on fire. Dad was able to put it out in time but still, it told me how dangerous they can be so please have a smoke detector in the room that the heater is in just in case. It's always best to be safe than to be sorry! !